I know, I know another food post, but this is a lifestyle blog and much of my life consists of food! Last weekend we headed off to Leamington Spa for Saturday day and night and for the evening we decided to try out Turtle Bay, which is a Caribbean Restaurant in the heart of Leamington Town Centre (with other locations around the country too). Upon walking past it at lunchtime, we noticed it was extremely busy and thought we better go and see if we needed to book a table. We were then informed that they were fully booked for that evening! To say we were devastated was an understatement, however the kind man said come anyway and they would see if they could fit us in. We nearly didn’t go back as it still looked rather busy, but I am glad we did as they said the wait would only be an hour, so we headed to the bar and browsed the cocktail list. The cocktails were fantastic! I went for Vanilla and Passion fruit Mojito to start with, and the BF went for the Marley Mojito. I followed this with a Strawberry Daiquiri. 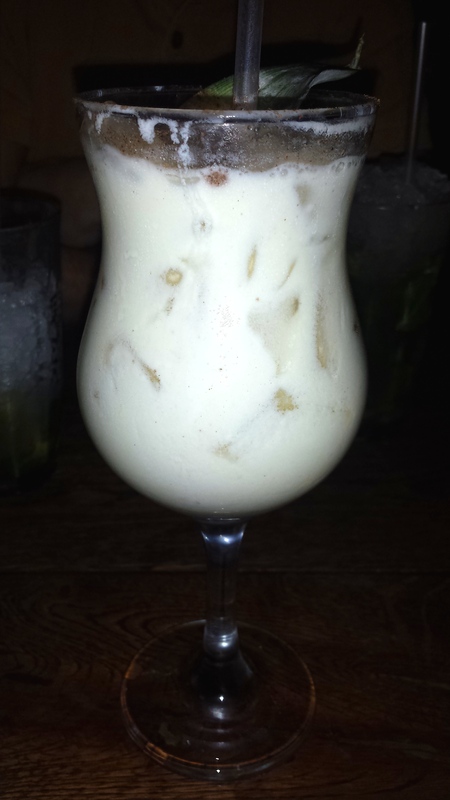 All the cocktails were lovely but special mention goes to the Koko Colada which was beyond delicious. In the end we only had to wait 20 minutes for our table, which was great considering how busy they were. The atmosphere in there is wonderful and lively with a very relaxing, fun vibe going on, a bit contradictory I know, but there you have it! Next came the difficult part of deciding what to eat, as it all sounded rather nice and very different from my normal food experiences. In the end we choose three starters to get us under-way, going for Jerk Pit Prawns, Jamaican Fried Whitebait and Duck Rolls. All three were on just on the right side of spicy for me, and all were really scrummy, with the Prawns being my favourite, there is just something about having to use your hands to eat them that I really enjoy! Next up I went for the Goat Curry with a side order of Fried Dumplings and the BF went for a lighter snack of a Pulled Pork Pun. My curry was lovely with lots of little bits goat meat which were really tender and full of flavour and a generous helping of rice and peas. The side order of dumplings were really stodgy just the way they should be, but I couldn’t eat them all, especially with the amount of rice I had to eat too! The Pulled Pork Bun, was huge for a light bite, I do have a feeling they don’t do small portions! The sauce on the pork was gorgeous with a hint of a kick to it. 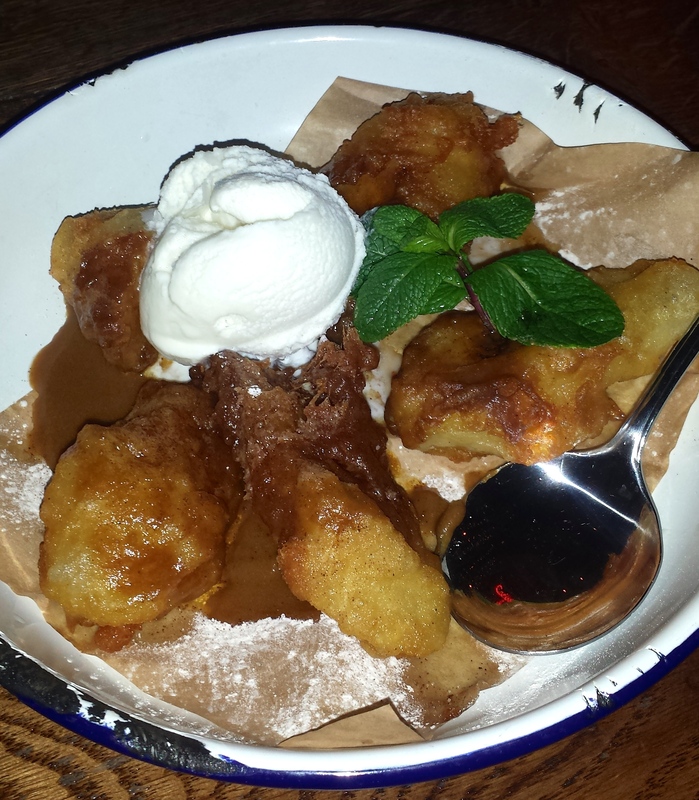 I couldn’t not have a pudding this time as they all sounded dreamy, and was really struggling to decide so I asked our lovely waitress to help me choose and she recommended the Banana Fritters, which I promptly opted for and was extremely glad I did! These were so delicious! Sweet and crispy and juicy but not mushy at all! Overall, I cannot fault the service, the food and the whole experience of our visit to Turtle Bay and we will definitely be going again, but may try the one in Birmingham next time to see how it compares! Beware, Birmingham we have really high expectations now! Have you paid a visit to Turtle Bay yet? Lenny loves…a new bf on the scene! I’ve been to the Birmingham branch. It’s always busy too! The prawns are sooooo good.